Labrador puppies bite. In fact, all puppies bite. And biting hurts! [wp_ad_camp_5]Puppies have very sharp teeth and they bite really hard. Often making fierce growling noises whilst they do so. 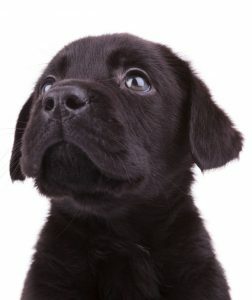 If your new Labrador puppy is sinking his teeth into your skin on a regular basis, you’ll be wanting to stop him right now. You may be tempted to correct your puppy firmly for biting, after all, he needs to know it is wrong to bite people! You may have heard that there is a training process is called ‘teaching bite inhibition’. A process that will help you put an end to biting, even though it takes a little longer. Or you may have been warned that ‘politically correct’ advice to ignore a puppy when he bites is ‘namby pamby’ rubbish. Conflicting advice is very confusing, and the best way to be confident in what you are doing is often to drill down to the reasons behind each approach. Bite inhibition is actually an ‘ability’ rather than a ‘method’. It is the ability of a dog to modify the force of his bite. [wp_ad_camp_2]Labradors have powerful jaws. Even when they are very small. An eight week old puppy is capable of crushing the bones in your little finger. If you are not convinced, check out what he does with a raw chicken wing. The fact that your puppy does not crush the bones in your finger when he bites you, is due to ‘bite inhibition’. Bite inhibition is partly genetic and partly an acquired ability, taught to your puppy by his mother, and litter mates. Later on, interaction and opportunities to play with other puppies helps to ensure that your puppy is competent at ‘pulling his punches’. Dogs with poor bite inhibition can get into a whole heap of trouble when they are older, we’ll look further at that below. 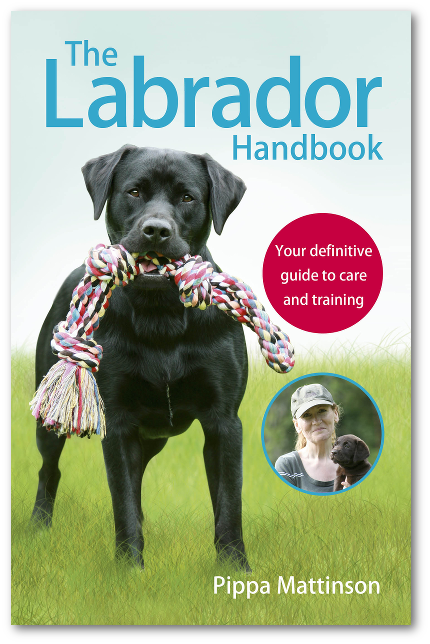 To make sure your Labrador stays out of trouble, when he comes home it is your job to put the finishing touches to his bite inhibition ability. This is especially important if he does not have a great deal of access to playing with other dogs. Because your puppy’s mother has a thick fur coat to protect her from your puppy’s teeth, she is not as sensitive to his bites as you are. So when your puppy comes home, you need to do a little work to get your puppy to ‘inhibit’ his bite sufficiently that he doesn’t hurt your human skin with his sharp teeth. This ‘human sensitive’ or ‘advanced’ bite inhibition ability is an important feature of your puppy’s development. 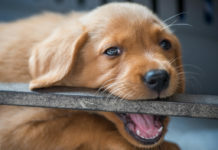 And studies suggest that if good bite inhibition ability is not acquired by the time a puppy is around five months old, it may never be achieved. So how do we go about installing good bite inhibition in our dogs. Let’s get to the important part! Some people, including some experienced dog breeders, will recommend that you simply stop your puppy from biting by firmly correcting him each time he does so. Some will even advise physical punishment. “It works” they will tell you. And it does. So this might seem like a sensible course of action. But there is a problem here. Suddenly stopping puppies from biting may give you a fast result, at the expense of some more important aims. One problem with correcting a puppy for biting is that the puppy quickly learns to be selective about who he bites. This is very important in families with children where puppies will often bite children ferociously, long after they have learned that biting grown ups has an undesirable and even painful consequence. 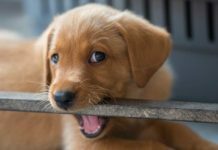 This may not bother you if you don’t have kids, but many experts also agree that suddenly stopping a puppy from biting may cause problems down the line by interfering with the process of acquired bite inhibition. Being completely prevented from even gentle biting, may mean that the puppy does not learn just how much force is safe to use on people. 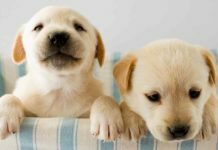 Why is bite inhibition for puppies so important? The trouble is, stopping biting is not the same as learning to control biting. 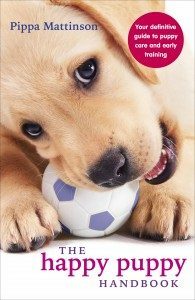 The concern is that preventing the puppy from learning advanced bite inhibition may cause him to harm a human, perhaps much later in life, when his bite is much more powerful and potentially dangerous. “But” you may say “if you have taught him not to bite at all, why would he bite someone in the future”? The answer is that there are triggers for biting, that may cause any dog, no matter how nice, to bite. Those triggers are fear, and pain. Many dogs that are injured, will bite for example. Many perfectly nice dogs that are trapped and tormented by a toddler, will eventually bite. We can, and should of course, do our best to make sure that our dog is never injured or tormented, but we cannot always be sure of protecting him. One day he may be hurt or badly teased, his growl of warning may be ignored. Small children are especially vulnerable in this kind of situation, as they may fail to recognise the intention of a growling dog. If your dog is forced to defend himself, he may do what dogs do in this situation, and bite. And if you are tempted to mutter ‘serve them right’ remember that dogs who injure children, even if provoked, are quite likely to lose their lives, or at the very least, their homes. Although many people get bitten by dogs, fortunately, most dog bites are not serious. The reason for this is that most dogs do have good bite inhibition. Your job then, is simply to make sure that your dog falls into this category of ‘most dogs’. So that if he is ever put in the awful situation of having to defend himself, he is able to pull his punches and give a mild warning bite. 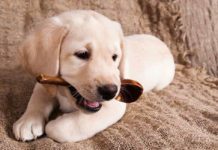 Essentially, by teaching good bite inhibition to our puppies, we are doing what we can to ensure that their bite is always inhibited, and never the bone crushing, devastating bite that a fully grown labrador is capable of. And we can do this, by finishing off the job that your puppy’s mother started some weeks ago. What you will be doing is providing your dog with numerous opportunities to find that really painful bites are not rewarding for him. This means ending any game or cuddle, and if necessary removing yourself from his presence. Some puppies will stop biting if you squeak, squeal or yelp, and many people recommend that you do this. By all means try this, but be aware, the noise has no effect on some puppies and is even encouraging to others. Your main trump card is the thing your puppy wants more than anything else – your attention. Persistent repetition is the key. This is a process, not an event. 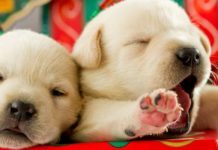 [wp_ad_camp_1]If you correct the puppy for biting, be careful not to frighten him so much that he stops biting altogether. He needs to work through this learning process. Most experts now agree that it is better not to use correction at all for this process. 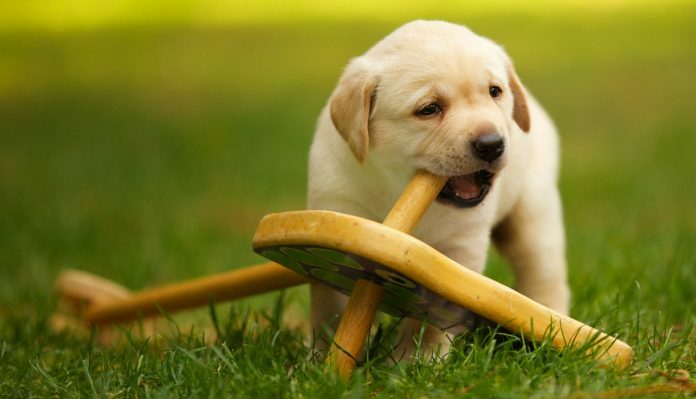 Once you have withdrawn your attention for a short while, offer the puppy a toy to bite on or play with, or let him sit on your lap and chew on a rawhide stick whilst you hold firmly on to the other end (don’t allow puppies unsupervised access to rawhide). Over the next few weeks, you’ll need to move your goalposts and become much more sensitive about how hard your puppy can bite. Until by about four or five months old, he is no more than gently mouthing at your hands. At this point, all force or pressure in his bite should be eliminated. Of course, mouthing is not acceptable in an adult dog, and the last phase in our training puts an end to mouthing. You can use the same system as above, but if your dog is persistent in his enthusiasm for getting his mouth around your fingers, you may find it helpful to clicker train him not to ‘mouth’ whilst you handle him. You can find instructions for this in The Happy Puppy Handbook. For more information on biting, do check out our ‘biting resource’ page. 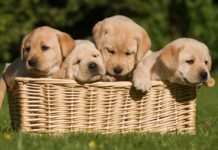 Most puppies are much more prone to bite hard when overexcited or involved in rough play, and there is a great deal you can do to avoid this. Previous articleHow Much Exercise Does My Labrador Need? I have a six week old boxer-pit puppy. The people who gave me her seemed to have taken her before she learned ANYTHING about biting. PLEASE help me. This is my first dog and I’m praticaly crying over the stress. Hi, We rescued a 3 month old lab from shelter. He was rescue only after “biting” they were going to kill him. My rescue partner took him but she worked fulltime so she had him until 6 months and said he doesn’t know how to throttle down. I have him now and his bite inhibition and hyperactivity are not calmed much even running him around 6 acres with my truck 10 times a day. He was in Quarantine for 20 days at 3 months old it may have created some emotional issues. This shelter does not allow interaction at any leavel with Volunteers, they get fed and watered and kenbel hosed for 20 days of his 90 days on earth. I try giving him a nylabone instead of my arm and he is ok but still biting just to point before breaking skin so he has some control. I have done rescue work for 31 years and never had a Lab still mouthing at 14 months old. Any suggestions not on the site. I have looked around it after my training didn’t work and it was basically what your saying. I need to think more out of the box to resolve it. Tx. I find your articles very helpful and I enjoy reading them. We have a 1 year old English yellow lab and he is still biting/nipping at people. He is a very mouthy dog, unlike our previous lab who wouldn’t bite a sole even if provoked. We have tried replacing our “appendage” with a toy, and that works only a few times. But we could be walking from one place to another (usually to ignore his negative behavior) and he will start biting at what ever he can get ahold of….a shirt, your arm, pants….to a point where sometimes he will rip the clothing. What are we to do in that kind of situation? If we turn to ignore, the clothing gets ripped! He is a VERY intelligent dog, and wants to be loving, but struggles with how to love appropriately. Any advice would be great! Thanks! We have a 3 mo old yellow lab and a 4 yr old Cavalier King Charles Spaniel. The two of tgem play loudly and aggressively. The puppy is now bigger and heavier than the Cav. Is their rough play and the puppy’s biting ok or should we limit it? The pup also drags the Cav around by her ears. 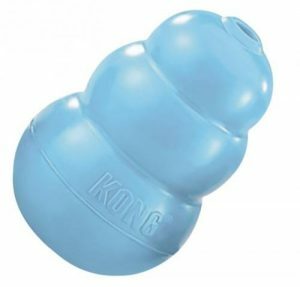 Will this teach the puppy she can play this way with other dogs? You may also want to consider as a breeder to have the litter an extended period of weaning well beyond the normal 8 week period.These ‘social skills’ and more are taught/learned far more efficiently by the ‘Dog’ rather than us mere humans .